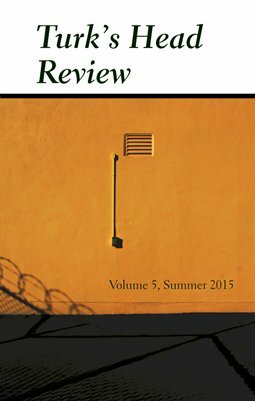 Issue 5 In Print, Now Available! We’ve been busy selecting, compiling and editing some of the best poetry, prose and artwork published online at the Turk’s Head Review site in the past year. And now our latest print issue is here in full bloom. Inside Issue 5 you will discover fine writing from Terry Barr, Matt Broaddus, Joseph Buehler, Dylan Crawford, Michael Fisher, John Grey, Lowell Jaeger, Rudy Koshar, Chara Kramer, Caroline Morales, Kathleen O’Neil, Elaine Olund, Jane Ozkowski, Andrew Pidoux, Alec Solomita, and Adam Tedesco. We also feature photos and artwork by Stacy Esch, Allen Forrest, Thomas Gillaspy, and Kirbee Veroneau. We’re proud of this issue and happy to share these writers in print with our readers and fellow writers. Print copies are now available, which includes a free digital download of the issue as well. Get your own copy today. Thanks and happy reading.